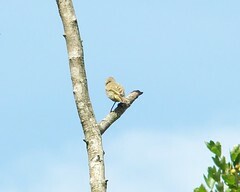 while out birding yesterday, I came across this bird, which at that time I had no clue what it was. 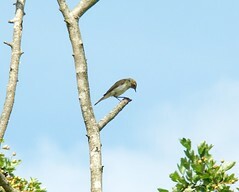 but then another bird jumped into view and seemed to be quite annoyed at the presence of the greenfinch. I clicked away and got a few pictures of it. I didnt know what this was either so I got as many pics as I could before both of the birds flew away. I think this one is a Bonelli`s warbler. Please could someone confirm? any chance we could have access to full size photos? GJS78 (a group admin) edited this topic 22 hours ago. Here you go, I ve changed the permissions on it. Yes, being able to view large would be very helpful, as would a location. 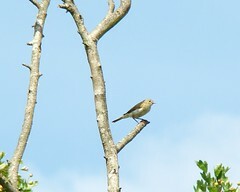 My first impression is Willow Warbler, but would like to see the larger view to be sure. For context, Bonelli's Warbler is an extremely rare vagrant to the UK with perhaps one record per year on average. A few of them turn up in spring with most late August to September. I don't think there's ever been one in July before. It wouldn't be the first time a seriously rare species has been discovered on Flickr though (like this second for Britain)! Bonelli's usually looks very white underneath and quite open-faced; I'd say this doesn't stack up on those counts. So what is it? The wings don't look quite long enough for my first impression, Willow Warbler, and although the legs may be partly silhouetted, they look quite dark. 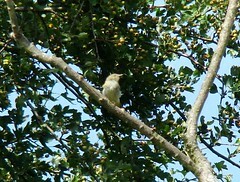 These Phylloscs can be tricky but I suspect this one's a Chiffchaff. Dave Appleton edited this topic 21 hours ago. I`ve been checking up books and the net to resolve the finer points but it just gets more confusing! "Bonelli's Warblers of either race look most like Chiffchaffs but have even plainer and more rounded-looking heads. They may show a suggestion of a pale supercilium but it is the lack of a dark eye-stripe which makes the face look so plain and the black eye stand out far more than in other leaf warblers. Other differences also include a yellower rump and yellow fringes to some of the wing and tail feathers, clean whitish underparts and a distinctivly pale base and lower mandible." anyway here are a few more pics if it would be of any help. 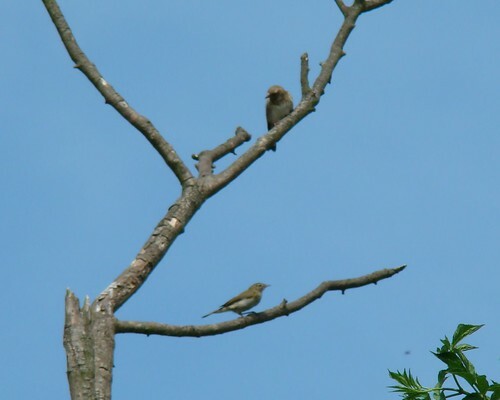 and here`s one for size comparison, the bird on top is a female greenfinch. i'm pretty sure this one isn't a bonelli's. they show a lack of strong face pattern and no STRONG yellow on head... also they don't ever have such strong marks between beak and eye as your bird does. 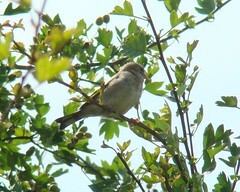 another good sign of a 'boney' would be a very white looking throat, your birds is yellow. 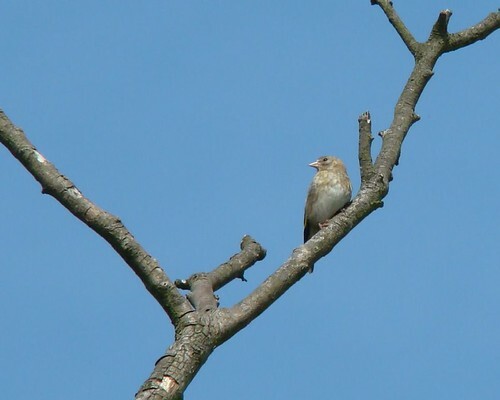 this bird really lacks the stubby proportions of chiffchaff. a wood warbler should (even with worn primaries) have longer wingtip visible... this leaves me with willow. slightly shorter (perhaps not fully grown) wings and fully yellow underparts perhaps suggesting a young un? p.s. i think the greenfinch may be a young goldfinch? edit: after reading daves new comment i've looked back at pic number 4 to see if i really did see those lighter legs.... now i'm not so sure if they were light or not.... anyone? GJS78 (a group admin) edited this topic 16 hours ago. dave... i forgot to congrat you on above dragon... okay so you didn't take the photo yourself but it must be nice to have found such an important record. Thanks Graeme - wish I'd found it in life not on Flickr! You may be right about it being Willow Warbler - that was my first impression too, based on the proportions, brightness and long supercilium. The leg colour probably isn't accurately discernible from the photos (the feet are paler but that's ok for Chiffie). The main thing that worked in favour of Chiffchaff for me was the length of the primary projection, although I'm not sure this is clear enough on any of the images to be competely sure about it, but on #4 it looks quite short to me. If it is a Willow Warbler though, I think it has to be an adult - I don't think the yellow on the underparts is extensive enough to be a juvenile. Tom, the books can be quite misleading about Bonelli's Warbler. They sometimes exaggerate the plain-faced expression of Bonelli's and underplay the clean whiteness of the underparts. The brightness of the wing/tail feathers is a good feature, especially when contrasted with the plainer, duller mantle, but not always easy to use in practice. This is certainly a frequently and easily misidentified bird and can be harder than people give them credit for - I've seen 2-3 Chiffchaffs which were claimed by other observers to be Bonelli's Warblers. On the other hand, a friend who is an excellent birder, much more competent than me, once trapped a vagrant Bonelli's Warbler and, even though it was in his hand, misidentifed it as a Willow Warbler and let it go. Fortunately it was seen again so the true identity could be confirmed. Probably his worst-ever birding experience! If it had been Bonelli's it wouldn't be the rarest warbler to have been seen in the Bristol area - I have happy memories of the Yellow-rumped Warbler at Eastville Park in '94! thanks for futher comments dave.... looking with fresh eyes this morning the prim projection does look remarkably short for Willow and you make a good argument on the 'yellowness' of young WW's so chiff is prob the best contender? maybe one we'll never be sure of? i remember reading of an experienced ringer showing the new guys what to look for when ID'ing them in the hand. 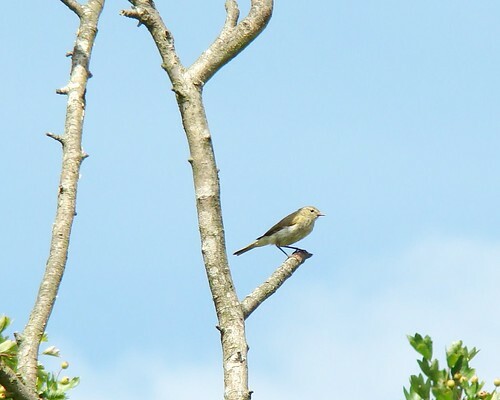 he confidently called willow warbler let the bird go and it flew straight into the nearest tree and started to sing "chiff... chaff... chiff"
GJS78 (a group admin) edited this topic 6 hours ago. p.s. yellow-rumped is quite a bird indeed! my last sucessful attempt was the Trumpeter Finch at blakeney Pt which i'm still getting earache from driver as this was quite an effort indeed.... day off on monday so i might look on the RBA and see if i can add another lifer this year... tho i wouldn't expect any good outcome to bring a bird as special as a yellow-rumped! Hey Thanks again Dave and Graeme. I suppose you both agree now that its not a Bonelli. 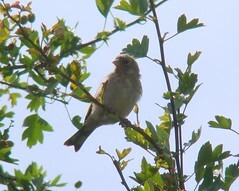 I guess that leaves the chiffchaff and willow warbler. As Graeme put it, maybe we`ll never be sure! 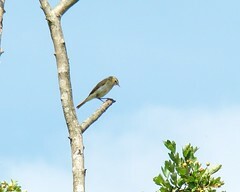 I`m very much a novice, but imho it looks too slender to be a chiffchaff (?). Unfortunately I was too busy taking photographs that I didnt pay attention to the call! Thanks for the tips Dave, I hope i`ll be picking up more from you as I post more on these forums. I was hoping to go birding in eastville park yesterday but couldnt make it that far. I hope to make that next week. Would you recommend any other good areas in Bristol? So, there you go, Its not a Bonelli`s warbler…there goes my claim to fame, but what great input from the experts. I`m glad there are people like Dave and Graeme that Novices like me can turn to.